It's time to have a little recap on 2012 and all the eating and drinking that was done therein. I've downloaded the viewing statistics from Stitch and Bear, and I've crunched the numbers while digesting Christmas dinner. 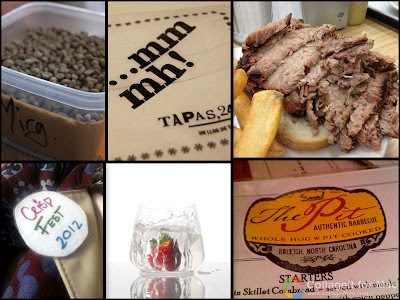 I've also reviewed all my posts from 2012 to pick out some of my personal favourites. 2012 was an incredibly busy year for me, involving a lot of travel and a hell of a lot of work. Despite that, I am delighted with how much I accomplished with Stitch and Bear during the year. 1. Bear - The viewing figures for Bear are streets ahead of other entries on the list, reflecting the popularity of this joint venture from Jamie Heaslip and Joe Macken. Several visits later, Stitch and Bear are still fans of the beefy Bear. 2. Musashi - Tasty and affordable sushi came to Dublin's Northside with the opening of Japanese restaurant Musashi. A BYOB policy, friendly staff, and excellent food have resulted in strong popularity. 3. Pho Viet - A very newly opened Vietnamese restaurant on Dublin's Parnell Street, Pho Viet has managed to make it onto my 2012 list. Thanks to Pho Viet, the legendary Vietnamese dish pho is now available for the first time in Dublin. It's wholesome, tasty and above all great value. 4. Greenhouse - In 2012, Mickael Viljanen left the Burren and Gregan's Castle to move to Dublin and take up residence at the brand new Greenhouse restaurant. His exquisite presentation and precision cooking have taken Dublin and critics by storm, and a Michelin star is surely inevitable in 2013. The Greenhouse is my personal pick for Restaurant of the Year. 5. Jamie's Italian - Love him or loathe him, Jamie Oliver has arrived in Dublin. His Dundrum restaurant has proved insanely popular so far, with queues often developing at weekends. Despite the commercialness, the food doesn't disappoint at Jamie's. 6. Skinflint - Another entry from the Macken family, Skinflint's low-key approach to pizza and meatballs has maintained it's popularity throughout 2012. Hipster chic ain't dead yet baby! 7. 777 - Featuring a bright orange formica counter and tattooed lovers on the tiled walls, 777 opened with a tijuana trumpet fanfare and really wowed with bright, fresh flavours. Their no-reservation policy can be annoying at times, but the cocktails taste damn good when you do bag a seat. 8. Ouzos - The first of two seafood restaurants to appear on this list, Ouzos in Blackrock certainly hit the spot when it came to fine fishy fare. How many restaurants actually buy their own trawler to ensure a fresh supply of seafood? 9. Izakaya - Located in a downstairs basement off South George's Street, Izakaya has proved a slow-burner on the dining scene, but anyone I know who has ate there raves about their wonderful mini-burger. 10. Oysters - The only entry to come from outside Dublin, Oysters has proved popular since it opened in Cork's Clarion Hotel. Oysters brings fine dining and deftly cooked seafood to Da Real Capital with great value to be had on the fixed price Table d'Hote menu. Like all critics, my personal selection doesn't always correlate to the public vote. I'm genuinely surprised that San Lorenzo's isn't in the list. I had some wonderful meals in this modern New York Italian inspired restaurant where chef Temple Garner showcases his cooking. 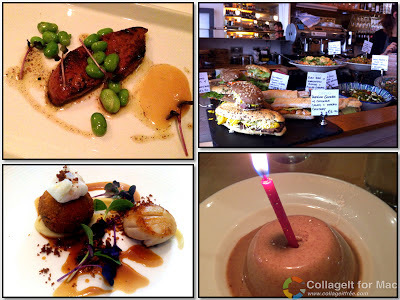 I may not like the wooden panelling, but I love the food, and I loved my birthday surprise. We were also excited by the food at Alexis in Dun Laoghaire, which was beautifully presented and very substantial. It's worth leaving the city centre and making the trip south. Down in Cork, ORSO Kitchen is bringing North African & Mediterranean flavours to life in a compact space. Great for lunch, it also opens some evenings for more relaxed dining. Once again, Bon Appetit continued to deliver Michelin food at relatively pocket friendly prices. I enjoyed Wagyu beef at the downstairs La Brasserie, as well as experiencing the food of the French Laundry and Nobu in the upstairs dining room. I decided to broaden my tastebuds, and therefore attended a coffee cupping session hosted by Brock from Cork coffee-roasters Badger & Dodo in L'Atitude 51. To say it was challenging would be putting it mildly, but it was lots of fun and very informative. I attended a food photography workshop with Scott Heimendinger, food photographer and blogger, at the Science Gallery as part of their Edible exhibition. Scott works with the Modernist Cuisine team and showed us some of the techniques used to generate their incredible photos. Later we got the chance to shoot our own action-packed (!) food photos. This year, I travelled to the US several times for work and holidays. I fell in love with proper barbecue, as epitomised by The Pit in Raleigh, North Carolina. Slow cooked meats that fall apart at the touch of a fork worked their way into my soul, as did the wonderful beef brisket and Rueben sandwiches we enjoyed at the famous Katz's Deli in New York. In April, we took a brief break to Barcelona where we drank far too much cava and discovered Michelin-standard, creative tapas at Tapas 24. The craving for chocolate topped with olive oil and sea salt is yet to subside. 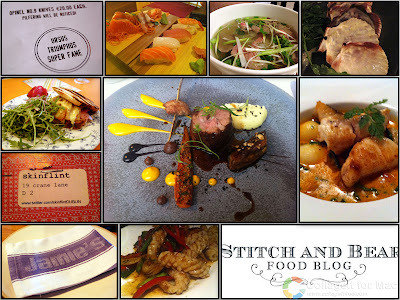 We attended the inaugural Crisp Fest 2012, a celebration of all things crisp, at the Bernard Shaw. With loads of crisps and lashings of crisp sandwiches, I really hope that this event becomes an annual fixture. My love of cocktails continued to grow, and appears to be reflected in loads of new cocktail offerings. The Vintage Cocktail Club opened in Temple Bar, The Blind Pig Speakeasy gives a feel of Prohibition America, while Paul Lambert mixes sensational cocktails at Kinara Kitchen. To celebrate the Christmas season, Stitch and Bear gave aways loads of food-related goodies. A massive thanks to Bombay Pantry, Mango Tree, Roganstown House, Urbun Cafe, Castle Cafe and ORSO Kitchen for sponsoring the prizes. You guys are awesome!! And so it is that 2012 draws to a close, but I am very much looking forward to 2013. There is an amazing vibrancy and creativity in the Irish food & drink scene. Charge your glasses and celebrate the year that was and the year to come. Hi Rosemarie - sorry for the delay in replying, and thank you for the feedback. Please let me know if there is any content that you'd like to see in 2013.